The color of this seafoam green, picture frame is perfect for cute ocean-themes that celebrate a quaint and wistful feeling of times past, in remembrance of nostalgic childhood memories walking along the beach, collecting sand dollars, and spotting sea urchins and starfish in tide pools near oceanside boulders and rocks. Adding to this theme, you might consider framing inspirational posters, poems, and antique signs that relate to sea life and the magic and mystery of wild waters. For the do-it-yourself crafter, consider building a homemade wooden shadowbox deep enough to house a collection of ocean-related items – from seashells, to netting, to photographs and antique signage – and then place this seafoam frame as a façade to contain the area with glazing. 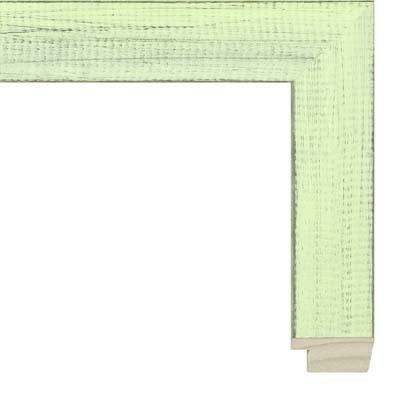 Matboard colors that pair with this seafoam green shabby chic picture frame include Riptide 9539, Make Up 9568, Half & Half 9509, Scrubs 9624, Water Fall 9897, and Omelet 9523.